For the first time since 1992 Berkeley Lab has captured three R&D Magazine R&D 100 awards in a single year. The new awards — for the Neural Matrix CCD, the Optical Sound Restoration System, and Ion Mobility Analysis — bring the Lab’s total haul of these “Oscars of Invention,” first awarded in 1963, to 37. A virtual co-winner of the year’s awards, Tech Transfer led teams of writers who helped the scientists craft the complex and demanding nominations and explain their work in terms that brought home its value to nonspecialist judges. The Neural Matrix CCD, a novel technology for patterning and monitoring networks of growing neurons, was created by Ellie Blakely, Kathy Bjornstad, and Chris Rosen of the Life Sciences Division, Ian Brown and Othon Monteiro of the Accelerator and Fusion Research Division, and Jim Galvin of Engineering, with Blakely and Brown leading the team and Jim Miller of the Creative Services Office (CSO) writing the nomination. Cellular Bioengineering, Inc., Honolulu, Hawaii, participated in the research and shares the R&D 100 Award. The Neural Matrix CCD monitors living neurons on an electric chip. 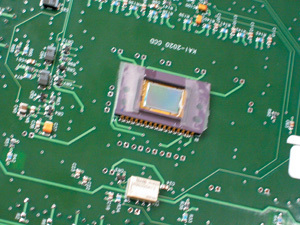 The Neural Matrix CCD is the first technique for crafting large arrays of networked neurons on a charge-coupled device. Diamond-like carbon deposited on the optical surface of the CCD is patterned in fine detail, then coated by a continuous layer of cell-culture collagen, which is seeded with living neurons. The CCDs record changes in electrical potential from each of these millions of individual nerve-cell sensors in real time, precisely mapping each neuron’s activity within the neural network. Initially designed to help scientists learn how neurons in the human nervous system communicate with each other, the Neural Matrix CCD is the first step toward bio-electronic chips that can restore the use of limbs and eyesight and improve mental function in patients, or provide neural networks of living cells for testing drugs and sensing neurotoxins. The Optical Sound Restoration System, the first “touchless” technology for restoring audio recordings on metal foil, wax, plastic, and other media regardless of scratches, warping, or mold, was created by Carl Haber and Vitaliy Fadeyev of the Physics Division. Julie McCullough, formerly of CSO, and Pam Seidenman wrote the nomination, and Loretta Hintz, also formerly of CSO, produced a video that brought the technology to life. 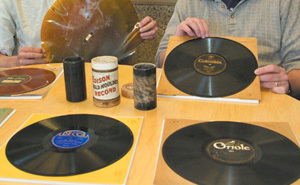 The Optical Sound Restoration System reconstructs the original sound from a wide range of media, from cylinder and wax recordings to plastic LPs, bringing back to life voices of the past. Since 1877, when Thomas Edison recorded “Mary had a Little Lamb” on a tinfoil cylinder, recordings on such diverse media as shellac discs, acetate sheets, and plastic dictation belts have captured an incredible range of material: the arias of Enrico Caruso; the poetry of Edna St. Vincent Millay; the lost language of Ishi, the last Yahi Indian; the words of historical figures like Alfred Lord Tennyson and Amelia Earhart. Many can no longer be played and are too delicate for traditional restoration. By adapting methods for analyzing particle tracks in high-energy experiments, Carl Haber and Victor Fadeyev developed a method for restoring these damaged and fragile recordings. Without ever touching the cylinder, disk, or belt, they create two- or three-dimensional digital images of the surface that can be computer-analyzed to reconstruct the recorded sound in high fidelity. Archivists estimate that 40 percent of the millions of recordings in the world’s major sound archives could benefit from restoration with the Berkeley Lab technology. Ion Mobility Analysis, the first technology for fast, inexpensive, accurate measurement and counting of individual lipoprotein particles, was developed by Ron Krauss of the Life Sciences Division, now of Genomics, with Henry Benner, formerly of Engineering, and Patricia Blanche, presently a guest in the Genomics Division. Bruce Balfour of CSO wrote the nomination. 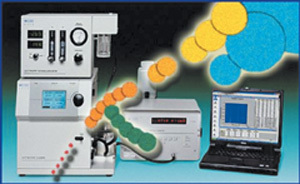 Ion Mobility Analysis makes use of a differential mobility analyzer and particle counter (left), an electrospray unit (center), and a computer to sort and count the numerous classes and subclasses of lipoprotein particles. For over fifty years, standard tests that measure levels of total cholesterol, “bad” low-density lipoproteins, “good” high-density lipoproteins, and triglycerides have been used to evaluate the risk of heart disease. 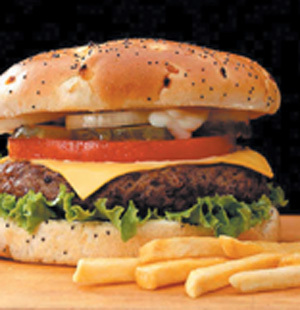 But half the heart attacks in the U.S. each year strike people with normal cholesterol levels. The distribution of size, quantity, and type of lipoprotein particles — which are much more various than standard tests can account for — provides a far better indicator of whether or not someone is at risk. Benner, Krauss and Blanche developed ion mobility analysis to measure the size distribution and count the individual particles in all classes of lipoproteins in a single analytical step. The technology measures the drift of charged, aero-solized lipoproteins as they are drag-ged through air by the force of an electric field. Charge and drift velo-city separate the particles by weight and size, and the sorted particles travel to a detector for counting. The winners of this year’s R&D awards will receive plaques at R&D Magazine’s formal awards banquet, to be held at Chicago’s Navy Pier on October 20. 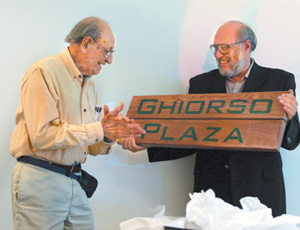 AFRD's Rick Gough presents Al Ghiorso with a sign announceing the designation "Ghiorso Plaza," an area adjacent to Seaborg Glen behind Building 71. On Friday, July 15, friends and fans of Al Ghiorso crowded the Building 50 auditorium for a morning of scientific talks celebrating his 90th birthday. The date also marked the beginning of his 64th year as an active scientist: although he supposedly retired sometime in the 1980s, nobody seems to have noticed. James Symons, director of the Nuclear Science Division (NSD), told of a recent memo from Ghiorso proposing improvements in detectors. Ghiorso was already a legend when Steve Chu was a student and postdoc at UC Berkeley in the 1970s, Berkeley Lab’s director said in his opening remarks. 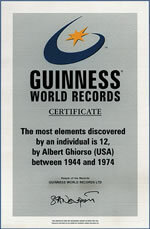 “He was the man who discovered more elements than anybody except maybe Adam and Eve.” Indeed, Ghiorso’s place in the Guinness World Records as discoverer of the most elements — a round dozen — is unlikely ever to be bested. Ghiorso chalked up his first pair, elements 95 and 96 (later named americium and curium) in 1944, as a member of Glenn Seaborg’s team at the wartime Metallurgical Laboratory in Chicago. Ten more elements followed after his return to Berkeley. His last official discovery, in 1974, was element 106. Twenty years later, after Ghiorso had led a worldwide campaign to recognize his friend and mentor, 106 was named seaborgium. Bernard Harvey, NSD’s first director, told of Ghiorso’s 1955 invention of the recoil method for capturing individual atoms of new elements. To get irradiated foils from the 60-inch cyclotron on campus to the lab in Building 70, Ghiorso would rush up the hill in his supercharged VW Beetle, past armed guards at the gate who on one occasion, having failed to get a warning phone call, gave chase with weapons drawn. “Pure luck” was how Norway’s Torbjørn Sikkeland described the discovery of elements 102 and 103, nobelium and lawrencium. Because foils were contaminated by lead, the experiment’s watchword became “get the lead out.” Bob Silva, named the “fastest chemist in the West” for his work with these short-half-life elements, convinced the audience that 102 and 103 were not, after all, the products of luck. 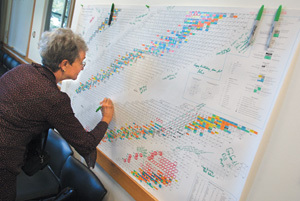 Friends and colleagues signed Al Ghiorsio's wall-sized birthday card -- a chart of the nucleides with all the elements and isotopes he discovered circled. 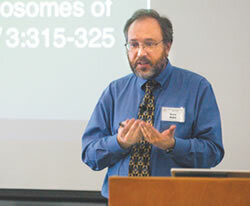 Bill Barletta, director of the Accelerator and Fusion Research Division (AFRD), introduced speakers who stressed Ghiorso’s accelerator and detector inventions. The discovery of element 106 with the SuperHILAC was one result. Jose Alonso, recently of AFRD, said that in 1974 Ghiorso was eager to use a new kind of detector to search for superheavy elements like 114, but Seaborg goaded him to looking for “just one more element the old-fashioned way,” mentioning that Ghiorso’s Soviet arch-rival, G.N. Flerov, was going for 106. The SuperHILAC was soon making 106 atoms, aided by experimental apparatus including ritual candles and Go-Kart inner tubes. Carol Alonso, a recent retiree from Lawrence Livermore Lab, told of the Oak Ridge meeting where Flerov’s data-free claim to have discovered 106 launched a 20-year controversy. Joining Ghiorsio for a group photo were 11 of his close collaborators and symposium speakers. 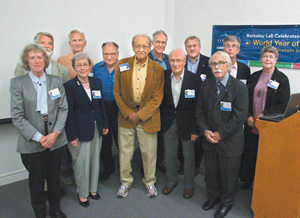 Left to right are Carol Alonso, Peter Armbruster, Torbjørn Sikkeland, Darleane Hoffman, Art Poskanzer, Al Ghiorsio, Jose Alonso, Bernard Harvey, Walter Loveland, Bob Silva, Kari Eskola, Pirkko Eskola. NSD’s Art Poskanzer related how a machine Ghiorso invented but never got to build — the Omnitron, a collider capable of handling beams of any element at high or low energies — led to the Super-HILAC, the BevaLAC, Brookhaven’s RHIC, and even DOE’s proposed Rare Isotope Accelerator. Meanwhile, the element quest continued. Oregon State University’s Walter Loveland told how a detector virtually hand-built on their own time by Ghiorso and his son Bill of the Engineering Department may have found a single atom of element 110. But the SuperHILAC was finished; the discovery could not be confirmed. The symposium’s last speaker was Peter Armbruster of Germany’s Gesellschaft für Schwerionenforschung (GSI), leader in the search for new elements since the 1970s, whose discoveries he described. 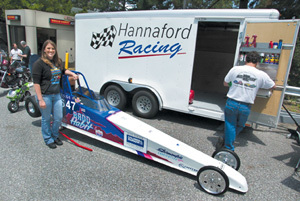 Armbruster’s appreciation of Ghiorso reflected the respect of both a colleague and a competitor. Among the gifts Ghiorso received was a Burmese jade peacock art piece from longtime collaborator James Wu, formerly of Burma. 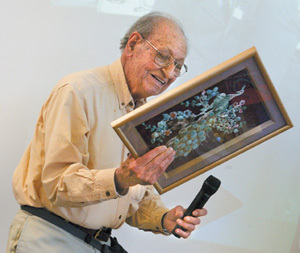 Cake, presents and reminiscences by a parade of admirers followed Al Ghiorso’s birthday symposium at a luncheon that filled Perseverance Hall to overflowing. 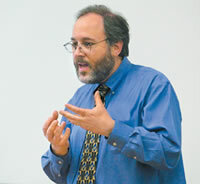 Many speakers recounted Ghiorso’s distinctive way of doing science. Bob Schmieder, who shared the SuperHILAC, noted that “whether the shift was 8, 16 or 24 hours long, all the data was collected in the last 30 minutes.” Bill Myers recalled a student who needed to calibrate a detector with an alpha-particle emitter; Ghiorso asked “Will californium do?” and when the student said yes, Ghiorso stuck his (highly contaminated) thumb on the detector. Ghiorso devoted a moving reminiscence to Wilma Belt, the woman he married shortly after Pearl Harbor, who changed his life in many ways, and who died earlier this year. At the luncheon’s close, Rick Gough of AFRD presented flowers to the General Sciences staff who made Ghiorso’s 90th a success: Martha Condon, Olivia Wong, Cathy Thompson, Sam Vanacek, and the “mind-boggling” and indefatigable Dianna Jacobs. 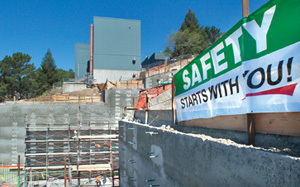 When the Department of Energy’s Office of Science Director, Ray Orbach, made his annual site visit to Berkeley Lab on June 24, he made it a point to schedule a meeting with the Berkeley Lab Safety Review Committee and other safety subcommittees. With 20 of us crowded around my conference table, Ray delivered a message that can best be described as sobering. He expressed his disappointment with the Lab over the past few months in terms of our accident statistics and his earnest desire to see us return to our former stature as a “star” in the safety world. In 2004, we had the best record. Now we have one of the highest accident rates. “The nature of these (incidents), as I see them, is frightening,” Ray told us. As of June 1, the rates of our total recordable cases (TRC) and Days Away and Restricted Time (DART) for accidents were both higher than the fiscal year targets established in our report to the University of California. Our 35 total reportable cases placed us seventh out of nine comparison science labs in the DOE, and our DART rate put us eighth out of nine. A one-day work stoppage at the Molecular Foundry was a sobering reminder to always put safety first. That, of course, is the big question. When I review all the incidents, I see that most of them are preventable — repetitive stress in ergonomics that acceptable equipment or workstation adjustments could fix; lifting and moving heavy objects, which adherence to policy and common sense would have avoided; slips and falls, the result of unnecessary hurrying; and just simple misjudgments. One especially egregious error involved a supervisor making the wrong call on a power circuit (he said it was disconnected; the worker short-circuited a live 110-volt line with his band saw while sawing through the pipe). What was particularly sobering about this event was that the supervisor and the technician both violated our most basic Lab rule on electrical safety: always consider electrical systems and equipment energized unless positively proven otherswise. Only authorized Facilities personnel are qualified to work on electrical distribution systems. Some of the accidents had to do with subcontractors working on the Molecular Foundry, who are none-theless this site’s responsibility. I called for a work stoppage one day a few weeks ago to remind those workers of the need to work safely. But beyond the concern about statistics, this is the bottom line: I want my employees healthy when they go home. I know we all are aware of safety and safe practices. I’ve been preaching this since I arrived last year, and so have all of the division directors. However, something’s not working and our message has not reached down to all of segments of Berkeley Lab. While many employees are working in a safe manner, some people aren’t taking the time to stop and think about their work and their colleagues’ work habits. A strong safety culture does that. You look out for yourself and your coworkers. You fix things that you see are wrong. You encourage the discovery and reporting of organizational weaknesses in safety. We’re not there yet. There’s a very successful program in Facilities with the acronym WOW — workers observing workers. In it, workers are rated for safety by their fellow workers, not by supervisors or outsiders. After intensive training, a volunteer becomes a safety coach. He or she then approaches other workers on a one-to-one basis and asks permission to observe their work practice. Together they go over a checklist, derived from at-risk behaviors identified in studies of real accidents. Corrections are made if necessary. The Engineering Division is planning to implement the WOW process soon, and we are looking to see if it makes sense to extend it to other divisions and programs. Other ideas proposed by the Safety Review Committee included intensive EH&S training for all supervisors, especially new ones; division-based instruction for supervisors and managers; and frequent walk-throughs of work areas by supervisors. You can’t legislate a culture change. It has to happen at all levels of our Lab. And if people need more incentive than their own health and safety, then perhaps they should be concerned for the Lab’s future and whether we remain as University of California employees. Ray reminded us that our new management contract is performance-based. It includes eight categories that will be graded for possible contract extension. Safety is one of them. “A minimum B-plus score is expected,” he told us. Our current accident rate would earn less than a B-plus. At the end of each year, excellent safety performance can extend our affiliation with the DOE through the University for an additional year. In addition, award fees (i.e., LDRD funds) assessed by the DOE can also be impacted, positively or negatively. We hold our future in our hands. To my colleagues in the Berkeley Lab community: let’s consider this a wake-up call. Let’s all adopt a safety culture — not just because Ray Orbach demands it, or because the contract requires it, or because I consider it important. Let’s do it for ourselves. 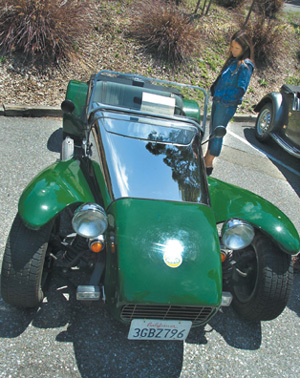 For the fourth year in a row, Berkeley Lab greeted “the first day of summer” with a car show that included everything from space-age vehicles and racing cars to truly historic models. To celebrate his 50th birthday, Doug Lockhart could have taken his wife up on her offer to rent a boat for the weekend or take friends up to Yosemite. But Lockhart, a special projects manager in the Facilities Department, had something else in mind. 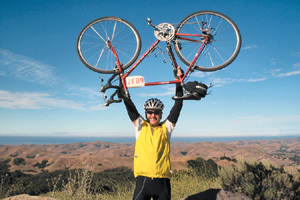 Instead of relaxing under the sun, he chose to huff and puff his way up and down steep hills, hot inland valleys, and windy coastlines for seven long and grueling days to be part of AIDS/LifeCycle’s annual 585-mile bicycle ride from San Francisco to Los Angeles. Doug Lockheart celebrates reaching a landmark along the ride to the finish line. Alongside 1,600 other riders and 400 volunteer “roadies,” he took off on June 5 on a seven-day journey. The physical challenge was anything but trivial even for the healthy, well-trained Lockhart. For so many of his fellow riders, including many who are HIV-positive (the Positive Pedalers), it was a herculean task. But this was no sightseeing ride, and the challenge took its toll. By Days 4 and 5, Lockart says, “you start hurting in places you never hurt before.” The closer they got to the end, the more inspiring the ride would become. People lined the streets along the route cheering them on; children gave them candy; and on the last night in Ventura, everyone came together for a colossal candlelight vigil. On Day 7, with 62 miles to go, Lockhart had a sore throat so bad he couldn’t talk. So did many others, by now suffering the effects of high winds, exposure, exhaustion, and nights spent in leaky tents. Fortunately that’s also when the inspiration to keep pushing kicked in. “No way do you want to get to the closing ceremony on a truck,” Lockhart says. The event raised a record $6.8 million—$3,200 of it from Lockhart, thanks largely to the generosity of fellow Berkeley Lab employees. You can still help Lockhart raise his contribution to the cause by donating at http://www.aidslifecycle.org/6037. AIDS/LifeCycle benefits the San Francisco AIDS Foundation and the L.A. Gay & Lesbian Center. "Look at the joints: all perfect." Don Beaton, Berkeley Lab’s construction manager for the Molecular Foundry, points to the neat rows of electrical conduit and piping that run along the ceiling on the fourth level of the Molecular Foundry. On all sides, workers are installing wall framing, utility piping, and ductwork for the wet labs that will make up the Foundry's Inorganic Nanostructures Facility. 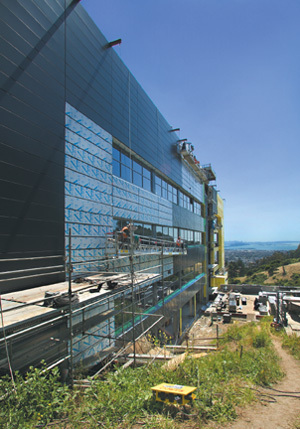 One floor up, the cold rooms, tissue culture rooms, and dark rooms of Biological Nanostructures are taking shape, and on the top floor more wet labs for Organic Nanostructures are under construction. Throughout the building, utility installation is going well. The construction of the building is designed to promote a sense of community and collaboration through open "interaction areas,� many of them with spectacular views. The Molecular Foundry is one of five Department of Energy Nanoscale Science Research Centers. The building design was very much a team effort, the product of many months of close cooperation between scientists, architects, engineers, and constructors. The result is a facility in which each of six levels is specifically designed to accommodate one of the six nanoscience facilities. The first-level Imaging and Manipulation Facility is built on a heavy concrete pad to minimize vibration effects on the Foundry's electron microscopes and atomic force microscope. 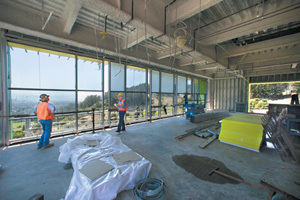 Built partially into the hillside, the second level will also provide a low-vibration pad as well as a clean room with temperature and electro-magnetic field protection for the Nanofabrication Facility's $4-million e-beam writer. Vibration levels on these floors are being monitored during construction to ensure that they meet design tolerance of 125 microinches per second. Electromagnetic interference is being minimized through panel board placement and power routing, and the use of fiberglass- or epoxy-coated rebar. Tthe Molecular Foundry rises on a hillside overlooking the bay. The main entrance is on the third level. In addition to housing the computing-intensive Theory Facility, the third level functions as an intake and common area for the entire Foundry, housing the directorate, a large conference room, and open office areas for visiting users and postgrads. These open offices are flanked by offices for staff scientists, a design strategy calculated to promote a sense of community among the Foundry’s users and staff. “The intent is for staff scientists to spend half their time on their own research and half collaborating on users' projects,” said Jim Bustillo, the associate director for the Molecular Foundry. Berkeley Lab researchers have kept up a fast pace of scientific advance over the past month. Here are a few highlights. Life Sciences Division researchers and collaborators, led by Mina Bissell and Derek Radisky, discovered a molecular pathway by which an enzyme that normally helps remodel tissues initiates the pathway to breast cancer, by stimulating the production of highly reactive oxygen molecules that disorganize tissues and damage genomic DNA. The July 7 Nature tells the full story. Eva Nogales and Hong-Wei Wang of the Life Sciences Division have discovered the forms taken by transitional structures of tubulin, the protein from which a cell's microtubules are formed, during microtubule assembly and disassembly. In an article in the June 16 issue of Nature, they show how this essential activity is controlled by a single small molecule, guanosine triphosphate. 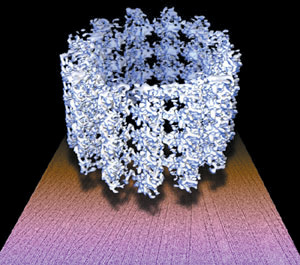 Soft x-rays from the Advanced Light Source can produce images of structures and their chemical, electromagnetic and other properties. The Materials Sciences Division's Center for X-Ray Optics used a technique devised by Weilun Chao to create zone plates for focusing x-rays having extraordinary resolution — better than 15 nanometers. Details appear in a June 30 letter to Nature. A study of twins — one a long-distance runner, the other a comparative couch potato — showed a strong similarity in the way the level of "bad" cholesterol in each pair of twins responded to diets that were high or low in fat. The study, which proves the importance of genes in cholesterol response, was designed by Paul Williams of the Life Sciences Division and appeared in the July 8, 2005, issue of the American Journal of Clinical Nutrition. For more information on these and other science stories visit the Lab's News Releases web page. Why sequence the fruit fly? The fruit fly has been the premier model for genetic research since the early 1900s. Much of what we know, such as that genes are located on chromosomes and the basic model of inheritance, comes from fruit fly research in the early part of the century. After the advent of recombinant DNA technology in the mid-1970s, fruit flies became an important organism for understanding genetic, developmental, and signal pathways in multicellular organisms. One of the big take-home messages from the genome project is that these basic processes have been very well conserved during evolution. The way your cells communicate with one another was established in evolution long ago when flies and humans had a common ancestor. This also applies to your biological clock and your sleep cycle. We can study these basic mechanisms in flies and learn how they’ve been embellished in humans. How can the fruit fly help scientists better understand human diseases? More than two-thirds of human disease genes have a corresponding gene in the fruit fly. This is good news, because after scientists isolate a human disease gene, the next challenge is to determine the biochemical mechanism it’s involved in. Fortunately, we can much more easily discover a gene’s function in fruit flies than in humans, which will inform our understanding of the human disease. There are dozens of examples of how this has already advanced our understanding of cancer and neurodegenerative diseases. What strengths do big multidisciplinary labs like Berkeley Lab bring to genome research? There are several reasons why the Berkeley Drosophila Genome Project couldn’t have been done in Berkeley if the Lab didn’t exist. Berkeley Lab is used to providing large amounts of space to projects that have a short duration. At our peak, we had nearly 60 people at Berkeley Lab working on the project, and there is no way you can get that kind of space on campus. Secondly, in the early days, we had to build our own automation methods, and the engineering and robotics expertise at Berkeley Lab was extremely useful. Most of our high-throughput work was done here. Also, a critical mass of scientists is needed for a genome project to be successful. Back in 1990, there were several groups at UC Berkeley who were interested in Drosophila. And the Human Genome Project was just beginning to gain momentum at Berkeley Lab, so it was a great collaboration. Genomics is also an information-based science. Our team must interpret how the information encoded in that string of A G, C, and Ts makes a fruit fly. We also have tens of thousands of images in our database showing different gene expression patterns, and we have a very active software group dedicated to displaying and analyzing these data, often in collaboration with other groups at the Lab and on campus. What’s next in the fruit fly project? I’m heading in a new direction, but the project is alive and well. There is a very active program at Berkeley Lab that continues to explore how the fruit fly genome works. Garry Karpen is leading a group that is studying the heterochromatin, the portion of the genome that is very complicated and located near the centromere. Another big challenge is determining the structures and functions of genes and how they’re expressed. In this vein, Susan Celniker is leading a group that is developing a functional interpretation of the genome. And Mark Biggin has a grant to study gene networks during embryogenesis. My research has been supported by HHMI since 1987, and in 2000 I became a vice president at HHMI and have been splitting my time be-tween here and Chevy Chase, MD. Next summer, I will leave Berkeley to head HHMI’s first intramural research center, the Janelia Farm Research Campus, which is located in Virginia. The lab will delve into very long-range basic research in an environment where scientists are encouraged to take risks — kind of like a Bell Labs for biology. We’ll take on projects that we don’t know will work in ten years. Specifically, we are interested in learning how the nervous system works, and developing new optical imaging methods to facilitate this research. We will bring together 400 scientists, including biologists, neuroscientists, geneticists, physicists, computer scientists and computational biologists. What about the next 100 years? One of the long-range problems in biology is to learn how the brain works. And eventually we’d like to understand human consciousness. That’s a long way off. First, we must understand how a fruit fly perceives the world and processes information. The fly is a great system to study because it only has 100,000 neurons but it exhibits fairly complicated behaviors. It has a much simpler brain than ours, but the basic mechanisms it uses to store and process information are likely to be conserved in evolution and embellished to make a human brain — just as was found for the mechanisms used to control pattern formation and cell-to-cell communication. It’s like the difference between a supercomputer and the processor in your cell phone. One is much more complicated than the other, but fundamental units work much the same way in both. Similarly, we want to study the basic rules that were established long ago and, we believe, only enhanced — not reinvented — to make our brain. To do this, we have to be able to see what the neurons are doing in real time at a single-cell resolution while the fruit fly brain is working. And just as we have tools to study genetic pathways in the fly, we are developing tools to study nervous system function. Such techniques include using genetically engineered neurons that fluoresce when they activate. The small size of the fly brain also means the entire brain is optically transparent and easy to image. This work should yield some basic rules that will be applicable to humans over the next 20 to 30 years. Office of Science Director Ray Orbach and Berkeley Lab Director Steve Chu launch a new network with a symbolic connecting of wires. 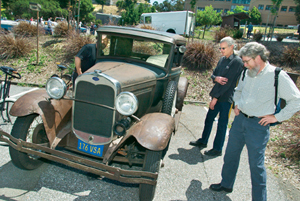 Office of Science Director Ray Orbach went on a whirlwind tour of several Berkeley Lab facilities June 24. His first stop was the Oakland Scientific Facility, where he launched a new high bandwidth network that links six DOE sites in the Bay Area. 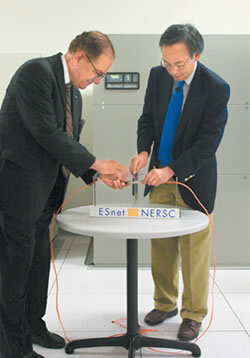 In a ceremony reminiscent of the 1869 event in which a final golden spike completed the trans-continental railway, Orbach and Lab Director Steve Chu launched the network by connecting two wires — one linked to the National Energy Research Scientific Computing Center (NERSC), the other to the network, which is part of DOE’s Energy Sciences Network (ESnet). The network links the Stanford Linear Accelerator Center, Berkeley Lab, the Joint Genome Institute, NERSC, and Lawrence Livermore and Sandia National Laboratories at substantially reduced cost. By increasing bandwidth to these sites, the new metropolitan area network (MAN) will help advance research in areas such as climate change, genetics, renewable energy, nano-technology, national security, and physics and chemistry. Orbach also toured the Potter Street Biosciences Facility, the Lab’s new address for multidisciplinary research in synthetic biology, cell and molecular biology, cancer research, and quantitative biology. Then it was up the Hill to the venerable Advanced Light Source (ALS), where Orbach lunched with ALS users. His tour ended with a discussion of the future of plasma-wave accelerators and applications with Wim Leemans of the Center for Beam Physics in the Accelerator and Fusion Research Division. NERSC Division Deputy Bill Kramer recently received a NASA Group Achievement Award for the Advanced Air Transportation Technologies (AATT) Project Team. 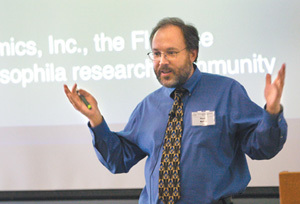 Kramer, who came to Berkeley Lab from NASA Ames in 1996, was one of the original seven members of the team from 1994 through 1996 and became the first AATT program office director in 1995. The AATT Project was completed in 2004 after nine years of highly successful research, development and technology transfer to the FAA and the airline industry. The major focus of the AATT Project was to improve the capacity of transport aircraft operations at and between major airports in the National Airspace System (NAS) by developing decision support tools and concepts to help air traffic controllers, airline dispatchers, and pilots improve the air traffic management. Angelica Stacy, a scientist in the Materials Sciences Division and a UC Berkeley professor, was honored by the National Science Foundation (NSF) as a Distinguished Teaching Scholar on June 22. Stacy is one of seven leaders in research and education who received the award for both groundbreaking scientific results and major educational contributions “evidenced by their strong teaching and mentoring skills," according to the NSF. The awards, worth up to $300,000 over four years, were presented in a ceremony at the National Academy of Sciences in Washington, D.C. 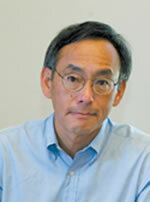 The American Rock Mechanics Association has awarded Berkeley Lab earth scientist Chin-Fu Tsang the 2005 Award for Applied Rock Mechanics for his seminal contributions in studies of "geohydromechanical processes in the excavation damaged zone in crystalline rock, rock salt, and indurated and plastic clays — in the context of radioactive waste disposal." Results of these studies were published in a major paper in the International Journal of Rock Mechanics and Mining Sciences early this year. Tsang received his award at the ARMA Annual Conference in Anchorage, Alaska in late June. A long-time engineer at Berkeley Lab who retired in 1989, Fred Vogelsberg died peacefully in his sleep on May 8. He was 81. From his Navy days, Berkeley Lab engineer Fred Vogelsberg gained a love of the sea that led him to become a Commodore at the Richmond Yacht Club. Born in Michigan in 1924, Vogelsberg came to California with his parents at the age of three and grew up in San Gabriel. He attended Pasadena Junior College until 1943, when he enlisted in the Navy. Upon his discharge after World War II, he returned to Pasadena, completed his studies, and then entered UC Berkeley. 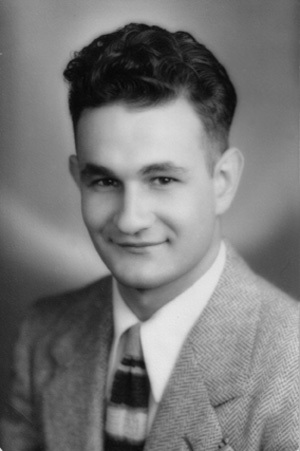 He received his BA in electrical engineering in 1950. After brief stints at McClellan Air Force Base in Sacramento and Rogers Engineering Company in San Francisco, he joined the staff at Berkeley Lab in 1952, where he worked until his retirement. Vogelsberg will be remembered by veterans of the Nuclear Science Division for his work on the Pulse- Height-Analyzers, and by MSD researchers for his work on radio-frequency induction heaters and large ellipsometer magnets. Probably his most notable accomplishment, however, was his contribution to the Nobel Prize-winning crossed molecular beam research of Y.T. Lee. Fred Vogelsberg is survived by his wife of 52 years, Louise, daughter Linda Vogelsberg Beroza and her husband Paul, and one grandchild. Published twice a month by the Communications Department for the employees and retirees of Berkeley Lab.